Additive manufacturing (AM) has the ability to fabricate complex geometries and components with improved efficiency and performance, not possible with conventional methods. A current challenge still remains in certifying processes and qualifying components in the effort to transition from prototyping to widespread adoption of AM for production. Process reliability and the repeatability of material properties require understanding, monitoring, and controlling thermal conditions throughout the part and melt pool geometry. 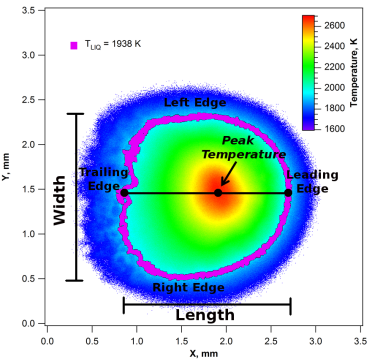 Extensive research relates process variables, such as beam power, velocity, and substrate temperature, to process outcomes, such as melt pool conditions and microstructure. Changes in the substrate thermal energy during deposition has a direct impact on melt pool temperature, geometry, and thermal gradient at solidification. Microstructural properties of AM parts are driven by the material’s thermal history and it is critical to monitor temperature and melt pool conditions as all locations within a part. In-situ thermal controls can maintain constant thermal gradients throughout the component build, maintaining constant melt pool characteristics and resulting in repeatable and quality components. Stratonics ThermaViz® Sensor Systems have been implemented in AM processes to monitor and analyze the substrate thermal gradient and melt pool. To understand the relationship between specific process variables and outcomes, single variations can be produced while key process variables are held constant. To study the relationship between melt pool characteristics as a result of changes in the thermal condition of the substrate, other process variables such as beam power, beam velocity, and material feed rate are held constant. In this case, substrate thermal gradients can be altered and maintained through the implementation of a calculated time delay between the deposition layers as prescribed by the sensor control system. Uncontrolled processing can lead to unchecked increases in the deposit’s thermal energy, whereas a controlled system can achieve a consistent and desired level of substrate thermal energy. 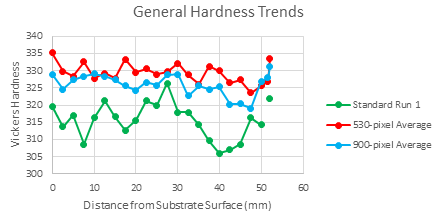 Thermal controls can impact the resultant average, maximum, and minimum hardness which corresponds to component strength and failure at the weakest points. Process monitoring and control is a key tool in understanding the relationship between the parameters and outcomes and assists in the development of the model build plan and AM machine selection to achieve quality results. Full integration of sensor systems is critical throughout component production to produce repeatability between operators and machines. Stratonics sensor systems provide independent information across multiple AM processes and systems. 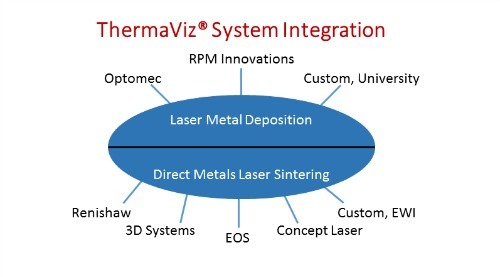 New sensor technology, signal-processing algorithms, and data-storage strategies are under active development with leading R&D organizations to address thermal data archiving and correlate detected melt pool anomalies with various types of defects to create a “trained” system that can produce defect-free components.